On Monday, the Survey of Unwanted Sexual Experiences results were released (see “Sexual Misconduct,” pg. 1), providing the first concrete quantitative insight into this campus-wide issue. The Thresher concurs with the statement President Leebron released in his email to Rice: These numbers are completely unacceptable. Like clockwork, the U.S. News and World Report have released their annual college rankings. Rice improved one spot: It is now tied with the University of Notre Dame at 18th after ranking 19th last year. We do not care about this. Or, rather, we should not care about this. Gallup and Purdue University have been conducting a multi-year study of college students and the satisfaction they derive from their education and employment outcomes — in other words, what we should care about. The product is the Gallup-Purdue Index, a measure of recent college graduates’ beliefs that they have “great jobs” and “great lives.” New York Times columnist Frank Bruni received advance access to the findings and detailed them in his Sept. 12 column. Of the five dimensions of life the survey attempted to measure — relationships, physical health, community, economic situations and senses of purpose — 10 percent of all college graduates described themselves as “thriving” in all five dimensions. 11 percent of graduates of U.S. News’ top 50 universities and 13 percent of graduates of U.S. News’ top 50 liberal arts colleges said the same. What, then, is the purpose of the U.S. News rankings if they seem to be a bad predictor of long-term satisfaction? Why do both academia and non-academia continually perpetuate this system of value? It’s probably driven by a combination of factors, including the impressionability of prospective students. Universities are incentivized to capitalize on this impressionability — assuming they want the best students, which they do — by rising in the rankings. Rice is not immune to this phenomenon; it’s subject to the same system. The U.S. Department of Education has semi-concurrently released their own college “scorecard” that subverts the U.S. News method. Instead of ranking colleges, the government guide provides data about average cost of attendance for federal financial aid recipients, four-year graduation rates and salary 10 years after matriculation for federal financial aid recipients. Rice falls around the average annual cost, way above average on four-year graduation rate and significantly above average for salary. The scorecard does not generate rankings; instead, it encourages comparison. It presents data that allow users to make value judgements. Rice should take a cue from the Department of Education scorecard and the Gallup-Purdue Index. Instead of participating in self-perpetuating systems that reinforce problematic notions of hierarchy and prestige, it should prioritize and refocus on what matters most to students: the university experience and Rice’s uniqueness. Unsigned editorials represent the majority opinion of the Thresher editorial staff. All other opinion pieces represent solely the opinion of the piece’s author. Due to a new Texas state law, Rice University Police Department will now be subject to open records requests (see p. 1) for information on their policing activity, which includes correspondences, activity logs and other documents. This requirement marks a continuation toward increased transparency in RUPD, following the introduction of body cameras to its officers in April (see “RUPD implements body cameras” in the Sept. 2 issue of the Thresher). The passage of this law is an important development for all Houston media, particularly Rice student media. We will now be able to more thoroughly investigate RUPD’s policing when complex situations requiring civilian oversight of police arise. For instance, open records requests would have been useful when we were reporting on the controversial RUPD bike theft incident that occurred in August 2013, in which officers hit a man over 30 times with a baton in an attempt to subdue him for arrest. According to a March 17 article in the Houston Chronicle (“Bill would make private university reports public”), requests made by the media organization KPRC for information on the incident were not honored. Following the passage of this bill, Rice must be subject to the same requirements of transparency as all other officers of the state. Considering RUPD polices areas just outside campus and often arrests individuals who are not affiliated with Rice, as in the case of the bike theft, this ruling affects not only the “Rice bubble” but also the local Houston community. This should not be seen as an occasion for fear or panic among the student body regarding the effects of disclosing police records on future educational or career endeavors. Although one’s slate may now only be hidden as opposed to wiped clean, there is little reason for future employers to seek out one’s record through the Open Records Act. Public institutions of higher education have been subject to this law for decades and this has not been a pressing issue for their students. Additionally, no information that violates the Family Educational Rights and Privacy Act will be made public. Information on particularly sensitive topics such as sexual assault, suicide and mental health, as well as juvenile records, will continue to be kept private. From the exemptions of these topics, it is clear that this change is not intended to compromise students’ right to privacy and confidentiality but to create a more safe and equitable campus. Just as with RUPD’s implementation of body cameras, this situation presents an opportunity for Rice students to become more aware of their policing rights, and moreover, to engage within their community. We are uniquely privileged to have access to a full-fledged police force that serves only a few thousand people, providing focused and expedited policing. We have a responsibility to educate ourselves on how to proceed with placing an open records request, both in order to be engaged within our community and to be better equipped in addressing situations involving student judicial proceedings. Rice University Police Department recently adopted the policy of equipping all officers with body cameras. Many support the implementation, including faculty, graduate students, undergraduates and Rice’s attorneys. The Thresher, too, is happy that RUPD has embraced body camera technology. Dashboard cameras can capture only so much, and recent events nationwide have shown that what can and cannot be verified through video footage is critically important not only in court, but also to public opinion. Considering the recent Texas Supreme Court decision (see p. 2) ruling RUPD officers as “officers of the state,” it is commendable for Rice to be a part of the movement toward increasing police oversight and operational transparency. However, both students and university administration have a responsibility to consider how the availability of body camera recordings may impact future judicial proceedings at Rice. Although it is true that the majority of RUPD arrests occur with individuals off campus who are not affiliated with Rice, there certainly are occasional altercations with students, especially related to parties. Students who are undergoing Student Judicial Programs or University Court proceedings may now have a potential source of evidence for their cases. RUPD statements should be taken at word, but if video evidence exists, it should be considered alongside or even given greater value than the original statement. Ideally, video evidence would be considered in every case, but this may not be feasible in order to deliver timely rulings. Some students will inevitably choose to defend themselves through this avenue. RUPD, SJP and UCourt should collaborate with the Student Association to set up a framework for handling video requests from students, whether that is within the original trial or through an appeals process. To ensure cases are adjudicated as fairly as possible and to minimize future complications, it is necessary to define criteria to determine which requests for evidence will be honored before such requests arise. There is an opportunity to pre-empt confusion and frustration, and Rice should work together to take it. As students with the privilege of a police force with body cameras, we have a responsibility to be aware of our rights when it comes to policing as a whole. We must educate ourselves on which situations require officers to turn on the video recordings and understand that RUPD is not obligated to honor requests to refuse recording, which may be especially important in sensitive situations. Claiming ignorance of either police or citizen rights is inexcusable. Some returning students have been asked to move off campus to make room for an over-enrolled class of new students. In a few cases, new students were switched between residential colleges after already receiving their assignments or had to live in a college different from the one into which they matriculated. The Thresher believes overcrowding is an inevitable and severe issue that demands discussion and preparation among the student body and administration during the year. The Thresher appreciates the administration’s efforts to fill every bed and understands the difficulty of predicting yield. It is not only reasonable but expected that the issue of overcrowding will arise and some shuffling of new students will occur. However, Rice lacks a cohesive plan to address overcrowding in a way that is suited to each of the residential colleges’ unique needs. For example, offering returning students the incentive to overcrowd rooms may work at Sid Richardson College, but is largely ineffective in the single suites at Martel College. Moreover, incentives that provide monetary compensation to returning students to move off campus are unfair to students who voluntarily chose to move off campus for the following year. While monetary incentives are a viable way of ensuring all new students are accommodated on campus, they must be offered and distributed fairly. This is a tough situation to address but the Thresher believes it can and must be improved to ensure financial fairness. Overcrowding diminishes from new students’ first year experience. The residential college system is designed such that students become almost immediately attached to their home college, and to learn last minute that one has been shuffled between colleges can be disjointing. O-Week coordinators are often forced to bear the brunt of parental anger even though they lack control over the situation. It is understandably difficult to strike a balance so new students do not learn of their residential college assignment too late or too early. 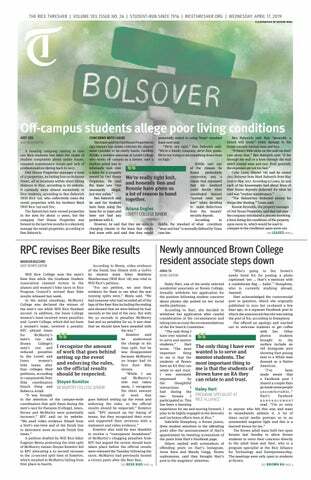 However, when new students are informed that their assigned residential college lacks the physical space to accommodate them, Rice and its student leaders, who are the face of O-Week, appear incompetent. One of Rice’s most commendable features is its emphasis on student leadership; however, if these leaders are not immersed in decision-making processes, they must face the consequences of decisions they had no hand in, in a situation they cannot improve. The student body, administration and college masters and coordinators should collaborate throughout the year to change overcrowding from an emergency situation to an anticipated issue with an established solution. As part of this plan, new students must be informed by the administration that residential college and rooming assignments are tentative. In order to make the new student transition to college as smooth as possible, it is necessary to accept the reality of overcrowding and address it as best as possible for all parties involved. The Student Association plans to begin a discussion in the coming fall about departmental grade inflation policies. These discussions come on the heels of legislation passed by the Faculty Senate in April 2014, which called for faculty-wide discussions about grading standards every five years, among other stipulations (see p. 1). The Thresher supports this renewal of discussion on a subject matter that continues to affect many students at Rice, especially now that the department of statistics has implemented a blanket policy of no more than 40 percent A’s in many of its introductory classes. While it is understandable that a large proportion of high grades in a certain class may be cause for concern, The Thresher maintains the opinion presented in our April 23, 2014 editorial that collaring grades as a response to grade inflation is not an appropriate response. By instating a policy where only a certain percentage of students can achieve high grades regardless of how many points they accrue throughout the semester, instructors engender a system that directly contradicts the spirit of positive collaboration so frequently touted by Rice. If individual professors, departments or the administration wish to see a more even grade distribution, then perhaps looking at course rigor or taking a more nuanced approach is in order. Considerations for major requirements, distribution credits and class content should be made to help determine a change in grading scale, not the performance of the current grading scale. Collaring grades is an arbitrary punishment to students that not only negatively impacts Rice’s academic environment of positive collaboration, but also does not address the root of any alleged problems with inflation. If too high a percentage of students receives A’s, the grading scale should not be the first place the faculty looks for a solution. The Thresher recommends investigating the content of the courses to see if it is appropriately rigorous for Rice students. The Thresher believes the statistics department’s turn to grade collaring is a precedent other departments should not follow. Princeton University recently repealed their grade deflation policy after 10 years, citing how it adversely affected students’ willingness to take risks in course selection, damaged the academic atmosphere and discouraged students from applying to the university. There is no reason a similar policy should be implemented among Rice courses. The Thresher encourages each academic department to consider student feedback in the implementation of grading policies, and to give significant thought to the potential negative consequences of such policies. Unsigned editorials represent the majority opinion of the Thresher editorial staff. All other opinion pieces represent solely the opinion of the piece’s author. The Student Association facilitated a student-only forum with residential college presidents about what constitutes a safe environment on campus, among other concerns, last Wednesday, March 12 (see p.1). More than 70 students attended the forum, which was held after the Senate meeting. The forum came in the wake of an incident at McMurtry College, in which a president-elect resigned after a friend ordered a stripper to attend a private party celebrating the win. Informal discussions about Title IX and Rice’s sexual environment ensued, but these conversations left many confused about the legislation’s role in moderating student behavior. As such, students may have expected the forum to directly address the McMurtry incident and clarify what a Title IX violation entails. However, the questions the SA used in the forum did not delve into specifics. They asked questions such as, “How do we avoid bad situations and what do we do when a value is violated?” While these questions did generate discussion, many left the forum with more questions than firm answers about campus values. The Thresher believes events like the forum should directly address student concerns. As the voice of the student body, the SA should embrace its role as both a facilitator of difficult conversations and an advocate for the solutions that arise from them. However, they cannot fulfill their role if these conversations leave students with more questions than solutions. Many at the forum expressed divergent opinions about the role of administration and their relationship to students. While it is necessary to promote discussion among the student body regarding the role of the administration in setting campus values, students deserve a seat at the table when their values and their community are at stake. Though administration necessarily plays a role in the discussion, the students’ voice should be loud and warrant recognition. To ensure that the student voice matters in discussions about campus values, the SA must work toward concrete solutions. Passing legislation, for instance, codifies student opinion in both an authoritative and historical record students can point to when administration takes action that goes against their interests. For the forum to effect change, the SA should craft legislation that expresses student opinion on Title IX and the campus environment. While it may be a good start for the SA executive team to sit down individually with the administration in the future to facilitate discussions, it is not nearly enough. Creating legislation is the most effective way to enact lasting change in our community, as it transcends the short-term institutional memory that plagues other less concrete solutions. Students wanted answers about Title IX and the McMurtry incident that the forum did not provide. In the future, the SA must take a stronger leadership role; haphazardly organized discussions without plans of action are insufficient. Tangible solutions, such as working groups and legislation, would better represent student voices in a lasting and meaningful way. Unsigned editorials represent the majority opinion of the Thresher editorial staff. All other opinion pieces represent solely the opinion of the piece’s author. Rice recently announced they will increase undergraduate tuition by 4.2 percent for the 2015-16 school year (see p.1). The announcement came in a press release that touted Rice’s status as a Kiplinger’s “best value” education and its relative affordability compared to peer institutions. The Thresher believes the press release ignores the reality of Rice’s consistent tuition-raising. Under President David Leebron’s tenure, Rice has justified outsized tuition increases as the cost of business rising, seemingly turning its back on a history of affordability to become more like its peers for its own sake. These consistent increases would be more understandable if the administration clearly communicated the purpose of each one. At one point, Rice was free for all students, and for most of its history tuition was significantly lower than that of other high-ranking, small, private research institutions. Before 2010, Rice even increased tuition at lower rates each year for undergraduate classes that had already matriculated, but that too has unfortunately changed. In 2000-01, when Rice’s average tuition per student was $17,720 — compared to Duke’s $24,890 and Northwestern’s $24,648 — Rice could claim significantly lower tuition than that of its peers, being on average 28.5 percent lower. However, Rice’s proposed tuition for the 2015-16 school year — $41,560 — is not as significantly lower than other school’s tuitions. At $47,488 and $46,836 respectively, Duke’s 2014-15 tuition (2015-16 numbers have not been released yet) and Northwestern’s 2015-16 tuitions are not as proportionally high as they once were — Rice’s tuition is on average 11.9 percent lower. It is the administration’s duty to explain why it needs to raise tuition by a comparably higher rate than its so-called peers. A circular argument that invokes notions of “becoming more like our peer institutions” won’t do. At a certain point, becoming similar to other like-institutions dilutes the aspects of a Rice education that make it pleasantly unlike peer institutions, such as its cost. Maybe the cost of doing business is simply going up, or maybe Rice has used the increases to fund new opportunities for students. Either way, Rice News’ press release does not show the student body anything along those lines — only tired rankings and comparisons. Unsigned editorials represent the majority opinion of the Thresher editorial staff. All other opinion pieces represent solely the opinion of the piece’s author. A recent incident at McMurtry College involving a stripper and the college president-elect has set into motion a debate about Title IX’s application and the sexual climate on campus (see p.1). Behind closed doors, the future college president was surprised by a stripper that a friend had hired for him and did not turn her away. According to an email sent to McMurtry on Feb. 22, multiple students filed complaints under Title IX alleging harassment after the circulation of photos and a video of the event. The president-elect announced his resignation in an email to McMurtry on Feb. 20. In the course of these events, Dean of Undergraduates John Hutchinson has explained that students must use good judgement when engaging in potentially harmful or harassing practices. Accordingly, the administration cannot and should not outline how students should behave in specific situations, as the vague nature of policies governing student conduct allows for flexibility. However, the Thresher believes student reaction and confusion in response to this case has shown a need for more robust communication of what it means to act in good judgment. Considering the recent complex applications of Title IX, it is unreasonable to expect those involved at McMurtry to have understood how to act in good judgment in this situation. The recent federal updates to the Title IX policy have led to the release of an updated student Code of Conduct and the sexual harassment policy, but an unacceptable level of mystery still surrounds this broadly applicable standard. Title IX is an extremely important piece of legislation, and its purpose should not be misunderstood. Among other things, it has ensured the safety of survivors of sexual harassment by requiring that accommodations be made for their well-being. It has also provided scholarships for female athletes commensurate with those for male athletes. In short, it has fought against institutional structures that have prevented women from realizing their right to education. To prevent Title IX from becoming the focus of student hatred as an excuse to ban all forms of potentially sexual traditions, the administration must clearly communicate the policy’s purpose and implications. Part of Title IX’s purpose is to prevent the creation of a hostile environment that constitutes sexual harassment; some would argue that this incident constitutes such a hostile environment. According to Don Ostdiek, Associate Dean of Undergraduates and Deputy Title IX Coordinator, a hostile environment is not related to sexual expression, but results from preventing students equal access to educational opportunities. Previous events involving strippers have set a common-knowledge precedent of appropriateness for sexual entertainment. Baker College used college funds to hire a stripper to perform in their commons for Willy Week, and Hanszen College has consistently incorporated a student strip show into their Mardi Gras party. Even Baker 13 and Night of Decadence, both of which occur in highly public spaces, can be construed as stripping. Considering Student Judicial Programs was made explicitly aware of the funding source and the activity involved in the Baker event, it was not unreasonable for the students at McMurtry to assume they could hold a similar event behind closed doors. Hutchinson has made clear that “opt-in” environments are acceptable under the policy. Considering those who attended the closed-door event were aware of the proceedings and were not forced to attend, this incidence seems to constitute an “opt-in” environment. If anybody in that room was unable to opt in or opt out, it was the president-elect himself. The administration should be sensitive to the novelty of this application of Title IX and the precedents set by other incidences of sexual entertainment when determining punishment for those involved. Title IX makes provisions for the survivors of sexual harassment; in this specific case, considering its relationship to sexual harassment, it is unclear if punishing the students involved constitutes an accommodation for the harassed. Moving forward, SJP can use this case as an example of when students did not use their good judgment, but it seems unfair to punish students from acting based on precedents of approval. Hutchinson cited a need for students to act as adults would in the real world and use their good judgment. However, in this case, students did act on their good judgment by holding the event behind closed doors and making it opt-in. The administration has the ability to set precedents for potentially sexual events, like NOD, Baker 13 and other events involving stripping through its adjudication of this incident. In order to gain students’ trust, SJP and administration must recognize student investment in this particular case and engage them in dialogue about the proceedings. What started as a private celebration of a student’s achievement has become a complicated discussion about what constitutes harassment on a college campus that is regularly home to sexually charged events. This is an important conversation to have, but we cannot lose sight of the fact that multiple individuals’ lives have been unexpectedly altered in the process. The administration and SJP should now work to ensure that students understand what good judgment and the consequences of not exercising good judgment entail. Unsigned editorials represent the majority opinion of the Thresher editorial staff. All other opinion pieces represent solely the opinion of the piece’s author. Sid Richardson College junior Jazz Silva will be the Student Association’s next president. She received more than twice the votes of both Lovett College sophomore Aishwarya and Jones College junior Sandra Blackmun in the general election to secure the position (see p.1). Silva has promised to bring Senate meetings to the residential colleges, involve athletes in the Student Association and implement Rice Education of the Future suggestions and the new blanket tax system. However, the Thresher asks that Silva and her executive cabinet also look to the successes and failures of the current SA administration in order to inform her presidency moving forward. Current SA President Ravi Sheth became leader of the SA with plans to “fix it.” Although his initial platform appeared vague and overly ambitious, Sheth generated tangible results under his administration, including the creation of Rice Education of the Future, blanket tax reformation and the pods system. However, Sheth did not make a strong enough effort to reach out to the residential colleges and maintain an approachable public presence. On topics concerning students such as the add/drop policy and Cheer Battle, Sheth’s advocacy either did not match the student body’s interests, or he lacked a response completely. In order to address the current SA leadership’s shortcomings, we recommend Jazz not only to directly communicate students’ interests to the administration, but to go a step further and voice opposition to the administration when their interests directly conflict those of students. Silva showed a willingness to question administrative action when she voiced opposition to Dean of Undergraduates John Hutchinson’s decision to remove a designated time for cheer battle during Orientation Week, and the Thresher hopes that she continues in this vein. Silva should regularly update the student body on her discussions with the administration. Her presidency provides an opportunity to make the SA president’s interactions with administration, which have typically not been communicated to the student body, public. However, for this plan to be effective, students must care about the SA. Thus, Silva must make student body outreach a priority; otherwise, there will be neither an engaged constituency to provide input nor an audience to witness the SA’s progress. Silva built her campaign on her ability to enact tangible change and a promise to increase student involvement. If she realizes both campaign objectives, the SA will be in a position to better serve the student body’s interests. Unsigned editorials represent the majority opinion of the Thresher editorial staff. All other opinion pieces represent solely the opinion of the piece’s author. The Student Association presidential debate, initially scheduled for Monday, is instead being held today, Wednesday, Feb. 11 in the Kyle Morrow room in Fondren Library at 8 p.m. in place of the SA senate meeting. The SA initially planned to host the SA presidential debate on Monday, before elections began. However, according to SA President Ravi Sheth, the debate was moved to Wednesday to increase the event’s turnout. Additionally, the SA did not release official information for all general election candidates until Monday, less than 24 hours before the ballot opened. Director of Elections Austin Cao said the registrar’s new requirement that all candidates must release information indicating good academic standing forced the SA to delay releasing candidate information. While the Thresher understands exigent circumstances forced the SA to make changes to the elections timeline, these changes have negatively impacted the student body’s knowledge of the candidates and issues. By creating such a large window of time between the start of elections and the debate, framed in an already short voting period, the SA effectively ensures uninformed voting. Moreover, the idea that delaying the debate will increase turnout to the event is flawed. Sheth’s decision to hold the debate during the scheduled Senate meeting time because those who would typically attend the former will be available for the latter only guarantees that Senate members will be present. Considering Senate members are typically at the forefront of Rice leadership, it is reasonable to expect these individuals to make time to attend the debate regardless of its scheduling. The debate should be scheduled at a time that is most convenient for the entire student body as opposed to a time that appeals to a niche group already engaged in student government. Consistently low voter turnout plagues the SA general elections. Increasing turnout is a responsibility that currently falls upon candidates themselves; however, candidates have their own interests in mind, and although they may contribute towards increasing turnout, they are more focused on becoming elected than sustaining a positive culture surrounding voting. We have long treated low turnout as an inherent problem without a solution, but the truth is that the SA has not yet attempted a solution. Evidently, elections deserve greater attention from SA leadership. For the sake of its own future, the SA must expand the role of the elections committee to include ensuring a smooth elections timeline and instilling students with a strong sense of civic duty. Unsigned editorials represent the majority opinion of the Thresher editorial staff. All other opinion pieces represent solely the opinion of the piece’s author. The SA Blanket Tax Crack Team has petitioned a revamp to the existing blanket tax system with a new “pot of gold” proposal. 200 student signatures are required for the petition to be included in the General Election ballot, where a 20 percent referendum and a two-thirds majority vote will put the measure into effect (see p.1). The Thresher strongly supports the Crack Team’s new proposal and encourages students to sign the petition and to vote for it in the General Election. Currently, organizations petition to qualify for blanket tax status and specify a requested amount of annual funding through a ballot in the General Election. If a blanket tax organization’s budget appears questionable in the Annual Review, they are brought to a Contingency Committee, which can determine if the organization has violated blanket tax laws and if a decrease in funding is warranted. The existing process has proven inefficient at and inconducive to encouraging fiscal responsibility among blanket tax organizations. Since a Contingency Committee must find three violations within a four-year period to decrease a violating organization’s blanket tax, it currently takes years to effect any change in funding, even if an organization demonstrates excessively large surpluses or fiscal irresponsibility. Fleeting institutional memory coupled with a bureaucratic quagmire renders the process infeasible; no subsidiary organization has ever seen a decrease in its funding. The “pot of gold” proposal, which calls for a standing committee, provides a welcome change to a broken system. The standing committee, to be comprised of students and advisors to subsidiary organizations, would predetermine which organizations qualify for priority funding and would conduct annual reviews on these organizations’ budgets. Additionally, new organizations can petition to become subsidiaries and qualify for priority status through the general ballot as before. The proposal also calls for surpluses higher than a predetermined amount to return to the “pot of gold” for use by other student organizations. The mechanisms outlined in this proposal will encourage fiscal responsibility in subsidiary organizations and will ensure student governance can preemptively address issues in blanket tax funding instead of undergoing a cumbersome process. Previous ballot measures have been defeated by a lack of quorum. The Thresher strongly encourages students to voice their support for the proposal by signing the Blanket Tax Crack Team’s petition and by voting for it in the upcoming General Election. If passed, the new measures usher in much-needed blanket tax reforms that promote greater fiscal responsibility and accountability among blanket tax organizations. Editor in Chief Miles Kruppa and Faculty Advisor Kelly Callaway are members of the Blanket Tax Crack Team. They did not contribute to this editorial. Unsigned editorials represent the majority opinion of the Thresher editorial staff. All other opinion pieces represent solely the opinion of the piece’s author. Rice has a scalability problem. As undergraduate enrollment at Rice has grown rapidly in the past 10 years, many students and faculty have questioned if the undergraduate experience has lost part of its value: its educational intimacy (see p.1). At the most recent Student Association meeting, the SA senate discussed legislation guaranteeing on-campus housing for Naval Reserve Officer Training Corps members (see p.1). Supporters argued that the midshipmen’s early-starting, rigorous schedule and service to the nation justified the guarantee. Those in opposition felt on-campus housing was not required for NROTC students to fulfill their training, as it might have been for Emergency Medical Services in-charges to perform their duties. Ultimately, neither side understood the others’ argument, and the two sides could not reach a middle ground, underscoring the fact that cases like these cannot be legislated by the entire student body. Dean of Undergraduates John Hutchinson has made an executive decision to not allot time to Cheer Battle during Orientation Week 2015 (see p.1). However, O-Week coordinators will retain the option of organizing an unofficial Cheer Battle during O-Week. According to Hutchinson, Cheer Battle “doesn’t represent who we are at Rice anymore” and violates Rice’s harassment policy requiring a non-hostile environment. The Honor Council Blanket Tax Contingency Committee found Honor Council “in violation,” giving Honor Council one of the three necessary strikes for the committee to begin considering reducing or removing their blanket tax. The Contingency Committee did not hand Honor Council an “aggravated violation,” which would have counted as to strikes (see p.1). During his speech to the Student Association on Oct. 1, President David Leebron presented a graph that showed an increase in average course quality and instructor effectiveness from Fall 2007 to Fall 2013 in all five academic schools that offer undergraduate degrees. However, the graph also showed that the school of engineering consistently had the lowest score in both course and instructor evaluations over time. Rice University students have reached a new level of laziness. This semester, Baker College Kitchen and West Servery have already replaced all 3,200 of their cups. Additionally, last year the serveries collectively purchased, lost and replaced 8,000 cups. To combat the problem, Housing and Dining has suggested adding 16-ounce disposable cups to the servery. and Tierra Moore, SA Environmental Committee co-chair, has proposed H&D not replace the cups to discourage students from stealing them (see p.1). The Student Association is soliciting suggestions for how to spend $40,000 of leftover sums from the Rice Endowment for Sustainable Energy Technology’s blanket tax, which was approved in 2010 and dissolved in 2013 (see p.1). The Student Association Blanket Tax Contingency Committee held their first meeting with Honor Council on Monday, Oct. 27 to discuss the documents it submitted for review. During the meeting, Honor Council defended its choice to allocate $50 per head to its yearly changeover dinner and other expenses that include the purchase of 15 tablets at $350 each and a new computer every three years (see p.1).